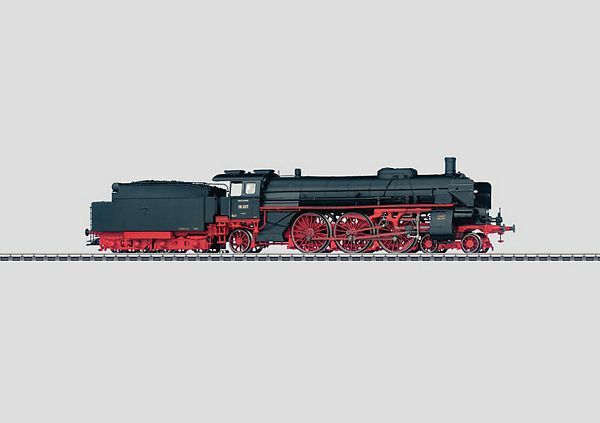 Prototype: German State Railroad Company (DRG) class 18.3 steam locomotive, 4-6-2 wheel arrangement. Built starting in 1918 as the class IVh for the Grand Ducal Baden State Railways. Use: Premium passenger service. Model: The locomotive has controlled, compact design, Softdrive Sine high-efficiency propulsion with an mfx digital decoder without a sound generator. 3 axles powered. Traction tires. The tender is constructed of metal. There is a close coupling between the locomotive and tender that can be adjusted for the radius of your curved track. A 72270 smoke generator can be installed in the locomotive. The LED dual headlights change over with the direction of travel. They and the smoke generator that can be installed in the locomotive will work in conventional operation and can be controlled digitally. There is a close coupler with an NEM pocket and a guide mechanism on the tender. Minimum radius for operation 360 mm / 14-3/16. Length over the buffers 26.7 cm / 10-1/2. High-efficiency propulsion with a control feature and adjustable running characteristics. Baden IV h - The Complicated Beauty. In 1915, the Grand Ducal Baden State Railways order 20 locomotives with a 4-6-2 wheel arrangement (Pacific) from Maffei in Munich in order to operate the Rhine Valley line more efficiently. This locomotive type was designated as the IV h and was planned mainly for use between Mannheim and Basle. The design was therefore laid out purely as an express locomotive for flat terrain. The driving wheel diameter of 2,100 mm / 82-11/16 was exceeded only by road no. 18 201 of the German State Railroad Company for a locomotive of its wheel arrangement. The maximum speed was set at 110 km/h / 69 mph however due to the brake technology of the time. Due to the events of World War I, this locomotive was built in 3 series from 1918 to 1920. When the last class IV h locomotives were delivered by the builder in 1920, the Baden State Railways were already incorporated into the German State Railroad, which took all 20 locomotives into its roster as the class 18.3. These units were stationed at the maintenance facility in Offenburg and were the flagship express locomotive on the Rhine Valley line. They could often be seen pulling the German State Railroad's new luxury train, the Rheingold. Maffei designed four-cylinder compound running gear for the IV h, whose inner cylinders were positioned far to the front and gave the locomotive its unmistakable look. Although the boiler for the class IV h was the largest of its time in Germany, its reserves were not all that great, and the water volume was relatively small. The super heater surface was also small in dimension such that the steam could only reach a temperature of 330° Celsius / 626° Fahrenheit. These facts made the water and coal consumption rather high and were considerably greater than that of the later German State Railroad Company standard design locomotives. The tender also contributed to the characteristic look of the locomotive. It was unusually short with a truck and with two axles mounted close to one another in the frame of the tender. During its service life, the Baden IV h was not very popular with either the locomotive crews or the railroad's managers because of its complicated technology, and it was replaced relatively quickly by the new standard design 01. It was transferred in groups to North Germany until all 20 locomotives were stationed in Bremen in 1942. They were used primarily in the area of the North German flatlands, an area they were best suited for, and where the new locomotive crews could better get use to the complicated system of compound high and low pressure cylinders. The maximum speed for these locomotives was increased to 140 km/h / 88 mph after the installation of stronger brakes, and the performance of the class 18.3 left many newer express locomotives in the dust. Except for one unit, all of the class 18.3 locomotives survived World War II. The new German Federal Railroad had no use for them and they were retired. With the reconstruction of the infrastructure and the normalization of the rail service, the need for fast experimental locomotives grew, and the German Federal Railroad was forced to overhaul three of the stored class 18.3 locomotives. These locomotives were modified accordingly and gave many years of valuable service for the Locomotive Experimental Bureau in Minden. Road no. 18 316 reached the speed of 162 km/h / 101 mph during a test run in Austria on the line from Kufstein to Wörgl and became the fastest provincial railroad locomotive. The last two locomotives were stored in 1969 and these beautiful units remain preserved as monuments for the provincial railroad era. This model can be found in a DC version in the Trix H0 assortment under item no. 22181.